A new paper from Bellwether released this week in recognition of the 10-year anniversary of the 2007 Head Start Act, acknowledges that federal effort enhancing teacher quality while reminding us what bipartisan support for children looked like. Thanks to that bipartisan legislation, as Sara Mead notes in US News & World Report, Head Start made great strides. “Quality of teaching in Head Start classrooms has improved markedly…,” she writes. Yet “instructional quality remains low in too many classrooms.” The new paper suggests job-embedded coaching for Head Start teachers can improve classroom practice. Of course, this is just one element of policy that needs to improve if Head Start is to raise quality for all the children it serves. For example, great progress has been made to increase the percentage of Head Start teachers – now more than 70 percent – with a BA or higher in ECE or a related field, compared to 44 percent in 2007, according to 2014-15 data in the State(s) of Head Start report. However, on average, Head Start teachers still earned almost $24,000 less than public elementary school teachers with the same credentials that year. Coaching is expected to improve classroom quality and outcomes for children. But without adequate funding, Head Start programs will continue to be forced to choose which of the different elements of policy and program that affect quality to emphasize, and how much quality should be sacrificed in order to enroll more of the eligible children. Now is the time to begin an important conversation about how the nation can best support the learning and development of its young children. NIEER recommends policymakers and the broader early care and education community examine the variance across states and develop policies that ensure every eligible child has an equal opportunity to attend a high-quality, effective Head Start program. NIEER Research Project Coordinator Kaitlin Northey discusses a new Early Childhood Clearinghouse report. The siloed nature and complexity of the early childhood field has made collecting workforce data challenging. Most efforts have focused on the frontline workers and overlooked the field’s leaders (e.g., National Survey of Early Care and Education, 2012). The 2015 publication, Transforming the Workforce for Children from Birth through Age 8, called for a unified effort to increase the capacity and competency of early childhood leaders and the Leadership Education for Administrators and Directors (L.E.A.D.) Early Childhood Clearinghouse has been an important step toward that goal. The Clearinghouse recently published Closing the Leadership Gap: 2017 Status Report on Early Childhood Program Leadership in the United States focused on program administrators (directors of early childhood centers, elementary school principals, and family child care providers) using multiple data sources to learn more about the leaders and policies in each state. The report assigns each state an overall policy lever score and provides average scores for five different policy levers: Administrator Qualifications in Child Care Licensing; Administrator Credential; Principal Licensure; Administrator Qualifications in QRIS; and Administrator Qualifications in State Pre-K Programs. Each state’s profile also includes details such as the number of leaders and their average salary, degree programs available, and the number of early childhood academies. The website features an interactive map displaying the density of child care directors by county in selected states, along with the policy lever rubric, and links to the data sources. This report, an excellent first step in identifying site-based early childhood leaders and the leadership programs available in each state, provides a foundation for future research and entry points for state policymakers interested in improving the capacity of their early childhood leadership. The report also offers a glimpse into the rich data already present in the Clearinghouse. For example, a National Profile section includes administrators’ demographics–information not typically included in reports of early childhood workforce data. A good next step would be enabling users to view data by sector, making it easier to spot—and address–gaps in data collection to, eventually, provide a more accurate portrait of early childhood leaders. 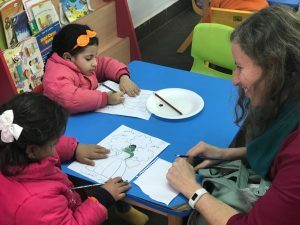 NIEER Co-Director for Research Milagros Nores Ph.D. recently joined researchers, education innovators, and the investment community in Egypt for a series of panels and workshops on advancing evidence-based research and expanding resources for education. 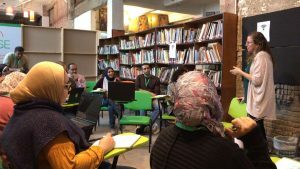 Dr. Nores, a RISE Global Advisor to EducateMe, ran a workshop on tools and instruments for evaluating child development and classroom processes with representatives from higher education institutions and program practitioners. The Educate ME Foundation promotes early/primary education programs. The new Center for the Study of Child Care Employment report details findings of the Early Childhood Higher Education Inventory: Principal Certification Programs [Principal Inventory] conducted in New Jersey in 2016. The Principal Inventory is a research tool used to assess the inclusion of course content and field experiences related to early education in preparation programs for educational professionals seeking to become principals. The report outlines an approach to rethinking and strengthening preparation and support for principal candidates and current school leaders. In 2015, the national Transforming the Workforce for Children from Birth through Age 8: A Unifying Foundation report laid out principles for effective preparation, ongoing professional learning and practice for the early education field. This week, New America published Transforming the Early Education Workforce: A Multimedia Guidebook, an interactive resource designed to make key takeaways from that 2015 report more digestible and actionable. The new online resource includes FAQ, summaries of report chapters, an overview of recommendations, videos, links to related resources, interactive maps for comparing state policies and a glossary. The National Association for the Education of Young Children (NAEYC) and New America are among a number of national, state, and local organizations engaged in the Power to the Profession initiative to establish early education career pathways, knowledge and competencies, qualifications, standards, and compensation across states and settings. NAEYC and New America now are working with states to identify and analyze key policies and processes related to the B–8 workforce. The first step was to uncover a state’s internal systems, structures, and regulations through a questionnaire. The questionnaire tool was piloted in early 2017 with Indiana, New York, and Wisconsin. This newly published brief is the first of a series, sharing responses to illustrate what types of new information can emerge from such a scan, particularly in the areas of governance, competencies, and preparation policies. Child Care Aware this week released its annual report and interactive map focused on the cost of child care across the country and the strategies that states and communities are using to help parents afford child care. New in this year’s report are county-level costs for seven states, Alaska, Arizona, Delaware, Hawaii, Massachusetts, Minnesota, and New Hampshire, through an interactive map. This recent Sleep Medicine Reviews paper presents a conceptual model and review of the empirical evidence related to the importance of a nightly bedtime routine for young children. The research provides support that a nightly bedtime routine can promote the wellbeing and overall development of young children and family functioning and suggests promoting a nightly bedtime routine may be a cost-effective method to promote positive early childhood development. Research recently published in Psychological Science describes relationships between preschoolers’ quantitative competencies and their school-entry knowledge of the number system, finding preschool children’s understanding that number words represent specific quantities (cardinal value) was strongly related to their later number system knowledge. A key finding was that the age of acquisition of the principle of cardinal value was central to both school readiness and later mathematical development in young children. A recent study published in Child Obesity found that structured meal setting and family meal setting, but not structured meal timing, were significantly related to children’s self-regulation in eating. Authors conclude that parent feeding behaviors, which can be potentially modifiable through education and training, can be a potentially protective parenting technique which could contribute to healthy weight development. Such parenting practices could potentially enhance preschool-age children’s self-regulation in eating. Louisiana has posted a Request for Proposals for the Statewide Early Childhood Ancillary Certificate Program on the Louisiana Procurement and Contract Network (LaPAC) which can be found here. An optional Pre-proposal Conference will be held TODAY Friday, December 15 at 2:00 P.M. CST. The Pre-Proposal Conference can be accessed via webinar. Updates or information regarding this RFP will be shared through the LaPAC system. Please send any additional inquiries regarding the proposal to RFP_LDE@la.gov.